At our Montgomery County Master Gardener meeting yesterday, we had a great talk by Cindy Brown of Green Spring Gardens about unusual edibles. She brought some sample plants along and was generous enough to donate some of them to our demo garden. I look forward to planting them soon! Some of the plants, like bunching onions and purple kohlrabi, I’d grown before, but here’s one that I haven’t tried: Chinese broccoli. It’s another plant from the Brassica family, so related to regular broccoli, and to kale (it’s also sometimes called Chinese kale, as well as gai lun and other names). The stem, leaves and flower buds are all edible, and can be cut from the plant which will then continue to produce new side shoots. 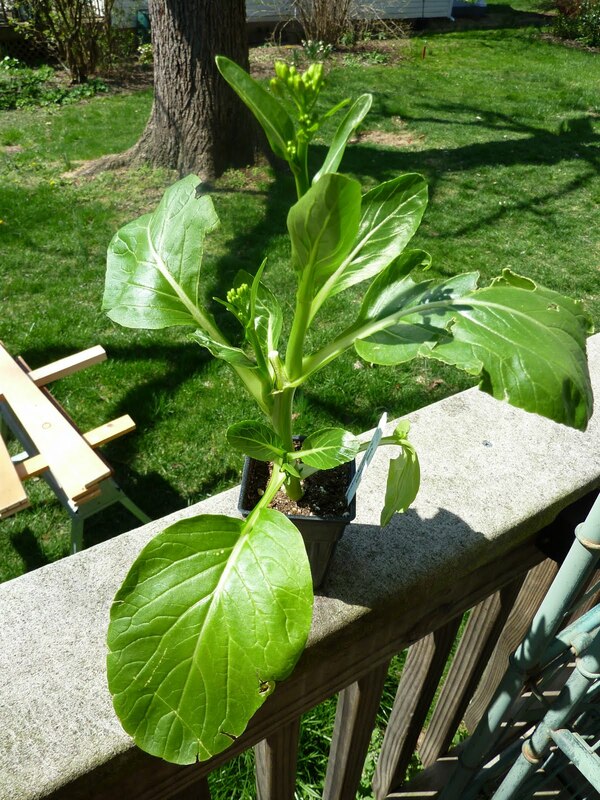 Chinese broccoli is grown from seed either early in the spring or in the summer for a fall crop, so maybe I’ll get some seed and look forward to a fall harvest. Seed catalogs are a good source of information about edibles you’re trying for the first time, and you can also search on the Internet for both growing information and recipes. One regional source (meant for farmers in the U.S. Northeast) is World Crops, which sorts by continent and country of origin or use, and is searchable. A great local resource is the Asian vegetables series that Wendy of the Greenish Thumb blog is putting together about growing, buying and cooking vegetables frequently used in Asian cooking. Please pass on resources as you find them – we like information here at Grow It Eat It! Cindy and her Green Spring garden are featured regularly on Adrian Higgins’ Washington Post blog about vegetable gardening (the “Groundwork” subsection of “All You Can Eat”). I liked this recent entry on kale – check out the soup recipe, too. We’ll be growing Nero di Toscana and Red Russian kale this spring in the demo garden, and then I’ll try some other kinds in the fall. Let’s hope the harlequin bugs stay away! I’ve also got some Jersey cow cabbage (also called walking stick kale) started and hope to grow it to a substantial height. If it works you will of course see photos. Great post! I am always looking for new things to try in my garden. I will have to give this one a go. Thanks for the resource tips as well! Thanks for the shout out! What a fun surprise. That Jersey cow cabbage is a trip. I'd love to see photos if it works! My favorite way to eat most Chinese greens is this: cook the greens (usually by lightly stir-frying or parboiling for a few minutes) and put on a serving dish. Chop lots and lots of garlic and fry in about 3 Tablespoons of oil till fragrant and lightly golden (but careful not to burn!). Drizzle about 1/4 cup oyster sauce (you can get this in any supermarket these days) over the greens, pour garlic and oil over the top. You would not believe how tasty this simple vegetable dish is! Yum, Wendy, that sounds great! And I hope you get some new visitors from the shout-out. Something ate my Jersey cow cabbage! I think it must have been a squirrel since it was on a shelf 4 feet up. I'll have to start again, alas.